Post-modern minimalism can go a number of ways these days. It seems to me that at times works can be guilty of form-formulaics at the expense of content. When that is the case, I generally find myself to be an unsatisfied participant in the listening sojourn. The building-blocks of content must be of musical interest or the whole edifice founders. Some out there either cannot or will not fashion suitable foundations. Pardon the mixed metaphors, but they leave us with a sometimes elaborate meal concocted out of unflavorful, mundane, collectively unpalatable ingredients. We leave the table in haste, even in some distress, searching for a bromide. This sometimes becomes all the more problematic when the work incorporates texts. The way of Einstein on the Beach worked well because of the abstraction of the textual matter and the flow of lines, but it may not necessarily serve as an ideal paradigm. Sometimes the paradigm can be applied in ways that are disastrous. Different Trains by Reich is a very successful alternate paradigm involving speech inflections but again this probably should not be indiscriminately applied to other textual and tonal material unthinkingly. The problems I speak of are decidedly inapplicable with Michael Byron and his The Celebration (New World 8077872). It is a long and involved work for baritone and piano quintet. Thomas Buckner handles the sung-spoken part with the highly musical ways he is known for. The FLUX Quartet and Joseph Kubera on piano realize the instrumental parts with a steadiness and motility that brings out the beautifully hypnotic qualities of the score. I've reviewed a number of Byron's works here before (see search box) and in every case I am left with a smile and a dream-like state. He is a force for a sort of pastoral presentness that seems always to reach me and do good things to my mood. Primary to the current project is the setting of Anne Tardos' poetry, introspective, probing, existential in a sort of down-to-earth practicity, if you will pardon the term, a poetic description of life as she images the experience. There are two zones of musicality that maintain themselves throughout. The quintet explores a radical tonality of shifting pentatonic and diatonic flow centers, with repetition and variations of the primal tones overlapping at contrasting velocities, the piano cascading with variable attack points like the contrastingly different speeds of multiple drips from the eaves of an old barn during a rain shower. The strings create a slower unfolding in a more legato manner. The patterns and pitch center are sectionalized, so that periodically they abruptly or somewhat more smoothly change the frame every so often. Byron does this so well we quickly surrender to the moment and flow along with him. The vocal part floats atop the wash of natural-like processual sounds, alternately reciting and singing the poetic texts, a largo-esque melodic flow changing key according to the modulations of the quintet. The text unwinds in real time, perhaps wisely avoiding repetitions that could potentially end in the gibberish of the "cow cow cow jumped jumped over the moon moon moon" sort. We readily are carried along with the musical current in a naturalistic way, somehow experiencing the experience as a microcosm of poetic life itself. The work immediately establishes itself and after a few listens stays with you as something rather profound and distinct. It is cosmically lyrical music, one-of-a-kind, with a beauty that lingers on in its impression even after there is silence. The Celebration makes its way into your deep memory-experience recesses and attaches itself to your own flow of being. That is a remarkable thing. 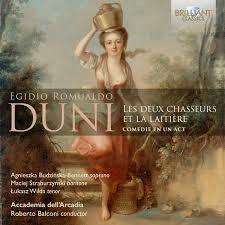 If I could come up with only one word for Henri Dutilleux (1916-2013) and his music, it might be lasting. Here in the present we experience the orchestral works as entirely modern, on the edge of such a world, speaking to us as a voice that is original, unexpectedly familiar yet strongly independant, by a consummate master of the orchestra with as much fertility of idea as brilliance of execution. A good place to start, or to continue, depending who you are, is the recent Orchestra National de Lille/Darrell Ang recording of Symphony No. 2 "Le Double" (Naxos 8.573596). The Second, written 1955-59, is a prescient blend of thick yet relatively translucent impasto--multi-rhythmic voicings and jazz-like punctuations. On the disk are two additional works. The "Timbres, espace, mouvement" from 1976-78 as revised in 1991 is a remarkably mysterious evocation of Van Gogh's Starry Night, a bracing panorama of sound showing us the Dutilleux command and poetic disposition of parts. It does for sound what van Gogh did for paint, only perhaps feeling in its unfolding more like today than van Gogh's yesterday, timeless yet fixed in Dutilleux's own later-day idiom. The composer describes it as "a longing for an infinity of nature." It sounds like that. The final work in the program consists of the ever unfolding series of ten episodic moments in time, the "Mystere de l'instant" of 1989. A "play of mirrors and contrasting colors" runs past our hearing beings in ways somehow both personal and modernistically universal. 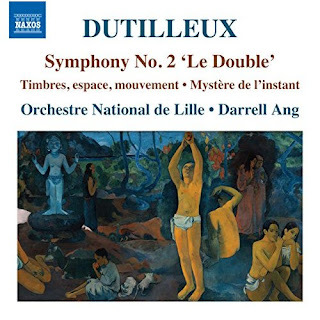 The coupling of the three works with the readily rewarding interpretations of Darrell Ang and the Orchestre National de Lille decidedly makes this a most attractive offering. There may be other versions of the Second that might have a slight edge on this one, but the three-work package and the Naxos price bring this to us as a valuable and energizing choice. If you have the Second, there are the other two works as well and more the better for it. If you don't know any of these works and want to explore Dutilleux's brilliance with an optimum seating in the hall of your music system, here you go! The irreplaceable sublimity of Josquin du pres (c. 1440-1521) in the polyphonic Mass setting is something one must live with to truly appreciate. It cannot be easily or adequately described by words. In the end it is the sensuous experience of the sequence of parts and their movement together that fills the heart and mind of the hearer and leaves an unforgettable mark on her/him, provided one listens sympathetically. There is a sense of inevitability when one hears the best of them. Josquin had an extraordinary ability to make his polyphony seem like an ideal of possibilities. 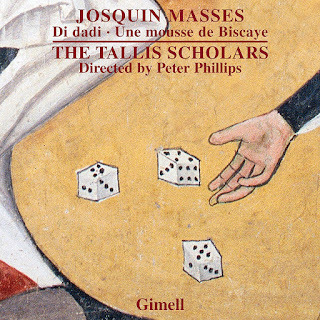 So in the hands of The Tallis Scholars, a talented and angelic vocal ensemble who exemplify the best practices in early music performance today, we hear two Josquin Masses: Di dadi, Une mousse de Biscaye (Gimell CDGIM 048). 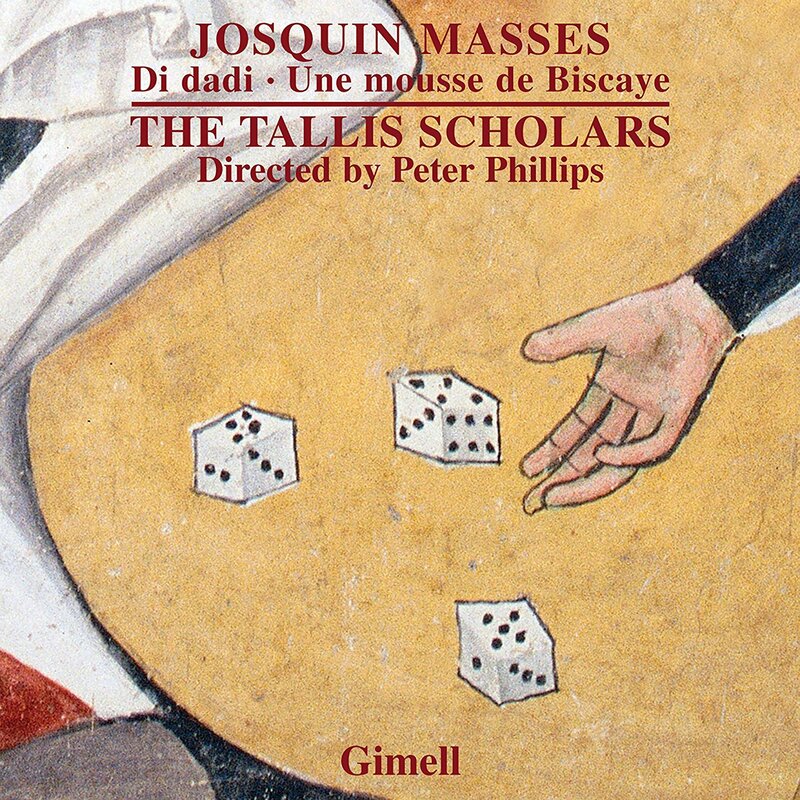 "Di dadi" is remarkable in that Josquin's creative intent was inspired by the throwing of dice. Beyond that point of extreme interest these two masses are at the highest levels of craft and art. The performances are very moving. The music sublime. Nothing more need be said. 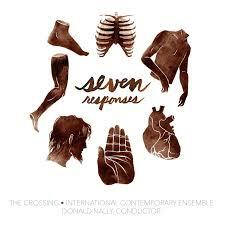 Donald Nally, the choral ensemble the Crossing and the International Contemporary Ensemble (ICE) present seven contemporary modern works responding to Buxtehude's seven cantatas from the oratorio Membra Jesu nostri patientis santissima. Seven Responses (Innova 912 2-CDs) is the result. It comprises a collection of seven beautifully wrought works that combine the-old-and-the-new, the impressions of the baroque labyrinth of Buxtehudian polyphony combined with an adventurist new music world. The composers are Caroline Shaw, Hans Thomalla, Pelle Gudmundsen-Holmgreen, Anna Thorvaldsdottir, David T. Little, Santa Ratniece and Lewis Spratlan. Each expolores a sonic universe that combines the vocal nuances of the Crossing and the instrumental evocations of ICE in fascinating ways. There is no question as you listen as to where the stylistic contemporaneousness resides: it is decidedly not a serialist or atonal realm of the last century, though there are at times bold modernisms to be heard. It is a tonal, sound-color oriented development that embraces the ancient and the modern in a newfound synthesis that appeals while it dishes out a wealth of musical nutrients. Today's recording serves to remind us once again that the annals of baroque and classical composers are filled with now unfamiliar names that history has partially erased from our collective memories, yet who may prove substantially worthwhile when we hear one or more of their works. Take today's example, that of Egidio Romualdo Duni (1708-1775). Les Deux Chasseurs et la Laitiere (Brilliant 95422) is something very attractive, a one-act comedy from 1763 that managed to garner a lasting and enthusiastic audience response in the opera world at the time, but now is almost completely unknown. The late baroque, nearly classical jauntiness of the work lives again thanks to the very game performances here by some distinguished soloists and the Accademia dell'Arcadia under Roberto Balconi. The arias are bright and hard-lined in their immediacy. The orchestral interludes sparkle happily. I am beguiled by the music and performances. Duni knows exactly what he is going here, and he is near-perfect in his execution. By definition, this is lighter than air. That makes for a delightful diversion. You understand how audiences found this music enchanting. With a little effort we can recapture that experience here in 2017, just by listening. There is a ravishing airiness that is as likable as a meringue made well. And no possibility of emotional indigestion! The realm of solo piano music has been especially fruitful in the modern era. The movement from Debussy, Ravel and Satie to the present is marked by many brilliant signposts. An unexpected find is in the music of Paul Reale (b. 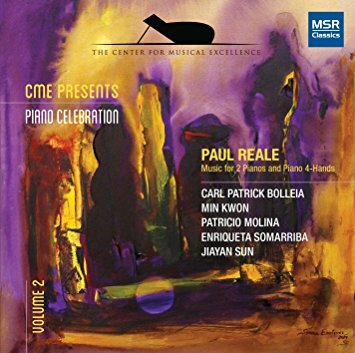 1943), as heard in the recording I was fortunate to receive, CME Presents Piano Celebration Volume 2: Paul Reale Music for 2 Pianos and Piano 4-Hands (MSR Classics 1612). This is more-or-less neo-classic modernism, with perhaps the presence of Stravinsky and Hindemith as precursors, but reshaped and reinvented with a pronounced musical imagination. What we have entails a continuation of Volume 1, the solo piano music of Reale that came out some time ago (and I have not heard). There are eight works in all on Volume 2, world premiere recordings of some choice and articulate pianism for four hands-one piano, two pianos and one short number for two pianos eight hands. A blow-by-blow description of the music would differentiate what for me comes across as a unified stylistic whole. It is something best experienced not a la carte but as a full, exemplary, consecutively construed feast of neo-classic cuisine, so to speak. I cannot find any fault in the performances and in the end Paul Reale brings us a convincing group of compositions that provide substantial fare and impress in their ultimate musicality. Hear this one if you treasure the modern pianoforte and want something new. My old composition professor reacted to my expression of admiration for Prokofiev with the thought that he was compromisingly derivative of Stravinsky. We agreed to disagree. To this day I hear of course the influence, but the differences are like Beethoven to Schubert. Sure, there is a debt but there is growth and distance that marks each as a creative light as much tabula rasa as akin in a line of succession. And the music "in the air" of early 20th century Russia, or more precisely the zeitgeist of the turbulent unfolding of history of the times helps explain the expressionist affinities between the two composers as much or more than some putative sort of one-way transmission of inspiration. If you do not agree maybe you have not spent enough time with the Prokofiev opus. No matter. Today's CD reminds us of that and of another debt Prokofiev held in the early Russian modernist flowering. 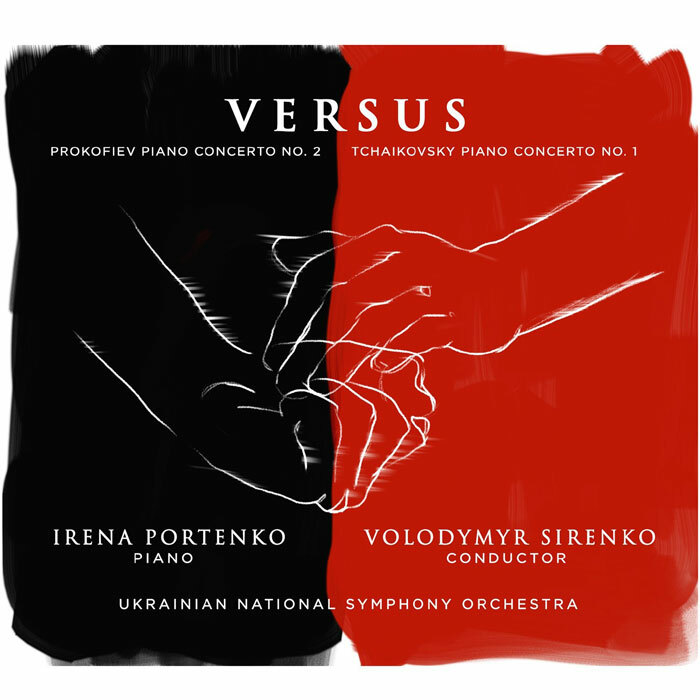 It is a recording of the remarkable pianist Irena Portenko and the Ukrainian National Symphony Orchestra under Volodymyr Sirenko in Versus, Prokofiev Piano Concerto No. 2, Tchaikovsky Piano Concerto No. 1 (BGR 417). This underscores another debt and another tabula rasa response--here, between the clangorous paradigm of the Russian romantic piano concerto as created by Tchaikovsky versus a wholly modernist clangorous brilliance from Prokofiev. Each work is a masterpiece of its kind. 50 years separate the two. They could not be more different in their use of a melodic-harmonic idiom that defines their trajectory, and yet there is something very Russian about both in their pronounced lyrical effusion. But for a moment we should think about the Stravinsky-Prokofiev nexus and differentiation. The year 1913 marks the debut of Stravinsky's game changing "Rite of Spring." It also is the very same year that Prokofiev completed the "Piano Concerto No. 2." A 1920 fire in Prokofiev's apartment destroyed the orchestra parts, but happily his mother had retained a copy of the piano score. Prokofiev set about reconstructing the piece in 1923, and that version is the one we still hear. It makes no difference in the end but the final version most definitely has the affinity of the dissonance and some of the savagery of "The Rite of Spring." Only of course it is a masterfully moving example of Prokofiev at his original best. Do we care in the end how the version we hear is in a parallel realm to the "Rites?" Sure, but we cannot find anything here that shows any kind of copying or mimicry. The work is pure Prokofiev, one of his early triumphs, a work that stands on its own as tragic, passionate, bittersweet, prototypically brilliant in the relation of the piano part to the orchestral response. And I am happy to say that this version is graced by the absolute fire and tenderness of Irena Portenko's performance, something that makes the music breathe and live for us as well as it ever has. That too is the case with conductor Sirenko's ability to get all the expressive saudade out of the Ukrainian National Orchestra that we could wish for. It is a remarkable performance, probably the best I have heard! The Tchaikovsky is extraordinarily well done, too. It is instructive to hear both concertos back-to-back in this program. I will leave it to you as to the insights one may glean from the comparison. Suffice to say that Portenko is an interpretive giant, the orchestra tuned to each work with articulate, heightened enthusiasm, and in the end you (if you are like me) are very, very glad of it. No self-respecting modernist should omit a close interaction with the Prokofiev. Of course the Tchaikovsky is essential fare for the Russophile. And the performances are marvelous! If we here in the States do not know the music of Hanns Eisler (1896-1962) well, it has mostly to do with his political leanings to the left and the trouble that got him into during the McCarthy era. He had embarked on a promising film score career here in the US when he ran afoul of the apparatus that sought to expose leftist artists in the media. He was deported and his music here was blacklisted more or less completely. That was a loss to us. It is tragic, for his music bears the stamp of a modern original. Thankfully, recordings of his works are far more plentiful than they once were. A fine example is this recent release, of a number of soundtracks from his American period: Hangmen Also Die, The 400 Million and The Grapes of Wrath (Capriccio 5289). These soundtracks cover the years 1938-43 and complement the box set of earlier works I have reviewed on these pages (see index search box above). Also included on this CD are the "Kleine Symphonie" of 1932 and the very brief "Horfleissubung" from 1931. The Rundfunk-Sinfonieorchester Berlin under Johannes Kalitzer do the honors for these works and their dedication gives us what sound to be very fitting performances, spirited and detailed. The pronounced modernist edge to the music recorded here reminds us that, after all, Eisler was a pupil of Schoenberg and even when composing film scores there can be heard an unwavering contemporary slant. He presents a wealth of thematic elements that attract and are situated within masterful developmental and orchestrational poetics. The pronounced trainwreck of my life right now means that I have had a little trouble devoting the absolute attention that this music demands and deserves. Nevertheless I can vouch for its excellence. I need to come back to it all again in the near future. Still, I do not hesitate to recommend this album to you as a very worthy presentation of substantial music from a sadly neglected period of his career. Do hear this! 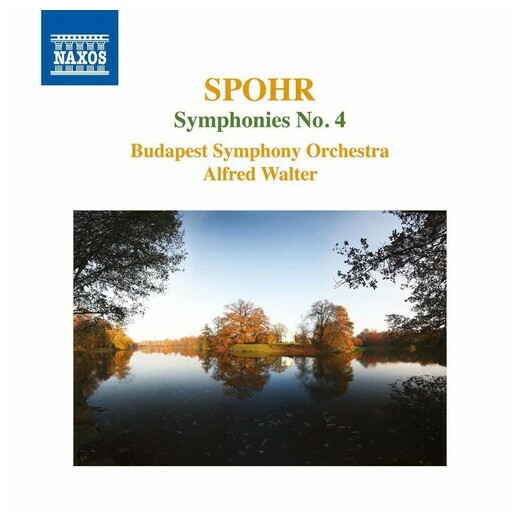 The complete Spohr (1784-1859) symphonies as recorded by the Budapest Symphony with Alfred Walter conducting turns out to be a fine thing, a revelation, the symphonic life's work of a composer that has seen neglect and in the very least is worth reviving. He reflects a world where Beethoven's star shines brightly and he does it his own way. The volume at hand covers Symphony No. 4 (Naxos 8.555398) . Spohr completed the symphony in 1832, a time of political upheaval at the court in Kassel, Germany. A new prince had assumed rule, and the money available for music was in jeopardy. Spohr set out to write a work based on Carl Pfeiffer's poem The Consecration of Sound. He ultimately decided to make it a programmatic symphony that followed closely the text. So one passage represented, for example, a gentle breeze and bird song before a storm erupts. One need not pay strict attention to the program to appreciate the music. It is ambitious Spohr and it sounds out with a satisfying trajectory, reaffirming that Spohr was one of the great symphonists of his era. Audiences in Germany and England reacted enthusiastically. Critics distrusted the programmatic idea and had their reservations. Hearing it now we find a good deal to like, or I do at least. After all, Beethoven's Pastoral Symphony stuck to a programmatic approach, too. And neither work suffers as a result! Accompanying the symphony are two short Overtures, to Faust and Jessonda, respectively. They are welcome additions. Now I must admit I did not have any idea what the complete Spohr symphonies would be like before I played the first volume I reviewed. A beautiful surprise was in store. Is he as good as, say, Mendelssohn? It is probably a meaningless question for he does not sound like Mendelssohn. He rings out with a personal take on the music in the air, then. What more can one expect? It is well enough. No. 4 is a gem. I am glad to have it. I suggest you spend some time with this CD. Wagner (1813-83) changed everything. His major operas brought a new way of thinking about motives and Tristan helped usher in the modern period via the pushing of harmonic language to the borders of tonality. His orchestration was bold, daring and insightful. But his concentration on opera left the purely symphonic realm to others. Composers like Bruckner came along and in part applied Wagner's innovations to the non-vocal worlds. Of course Bruckner and Mahler (and Richard Strauss) did a great deal more than that, but they were nevertheless indebted to Wagner for where they went. And so, for that matter, was Schoenberg, but that brings up more than we can handle for this post. Interestingly enough, Wagner in his early years did write a bit of symphonic music. The two works that have come down to us, The Symphony in C major and the Symphony in E major (fragment) are available in a new Naxos release by the MDR Leipzig Radio Symphony Orchestra under Jun Markl (Naxos 8.573413). The back of the jewel case tells us that these two symphonies "stand as a tribute to Wagner's passion for his great idol Beethoven," And indeed, one hears such elements clearly throughout. They were student works, written when Wagner was in his teens and early twenties. They are remarkable for that. But even at that early date there is something rather Wagnerian happening with these works--which may only be to say that Wagner sprung from the Beethoven ethos. But no, one gets glimpses of something further along, even if in infancy. The E Major is a fragment. Felix Mottl completed the orchestration much later. Wagner was nowhere near where he would ultimately be. Yet neither of these works seem immature fluff; they are if nothing else supremely serious undertakings. The C major is the more involved of the two, as one might imagine even before hearing. There is thematic originality to be heard within the Beethovenian mode. Some parts seem pretty closely derivative but then there can be developmental sections that go their own way. In the end this music is of extraordinary interest to those who know the mature Wagner intimately. Yes, you can hear the kernels of the later composer here. But you also hear a thematic naivete that was the Wagner of those years, a not unattractively expressive and talented youth saying what he could. The music brings a goodly amount of delight. These are no masterpieces but they weather surprisingly well. 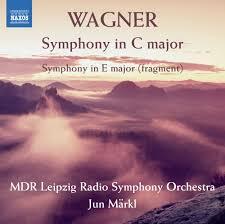 Anyone who wants to trace Wagner's development will find this CD enlightening, but also a good listen in itself. The Supreme Court "Citizens United" decision was, to say the very least, decidedly nothing to do with the upholding of the Constitution as the Founders thought of it. It was a perversion of logic, a fiction that has lead us to anti-democratic infusions of great wealth to undermine the election process. I am not the only one to think this. It is one of the more dangerous farces to confront us in our lifetime. Only one of more than a few, but an especially insidious one. Composer Ted Hearne clearly is one of "us," not a man with or speaking for the influence of the grand cartel of the rich. His Sound from the Bench (Cantaloupe Music 21126) is all about Citizens United, a nightmare in a sort of poetic haze that may sublimate the horror of the judgment, but no, does not seek to diminish it. This is a choral work of a postmodern, sometimes minimalist sort. It features (as did yesterday's) the landmark choral group the Crossing with Donald McNally at the helm, plus some avant rock textures from two electric guitars and drums. Where to begin? 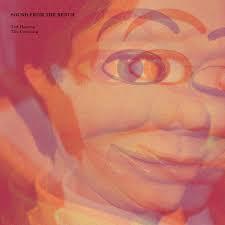 The corporation is a person, a ventriloquist dummy in the end. Not at all human but masquerading as one, manipulated by a wealth-manufacturing entity and acting in its interests. Hearne uses various texts to set off the decision and lament the demise of our own personhood, the degradation of the human being unit that is the core idea behind representative government. The music has a great deal going for it. There are sophisticated multi-part passages, the deliberately banal cutting in to dramatize things, and a great deal in between. It is a work where I must admit on the strictly musical level I greatly appreciate much of it, and some elements less so. But the good outweighs the less good with a balance decidedly tipped onto the positive side. And the subject matter could not be more important to us. So I thank Maestro Hearne for this and recommend for sure that you hear it! Like any style of music, there are Post-modern composers who write beautiful, breathtaking works and others who either are inconsistent or just do not have the talent, sad to say. Of the whole bunch Gavin Bryars to me is decidedly in the first category. His music, basically anything I've heard of his, has that special something that comes through whatever the premise. 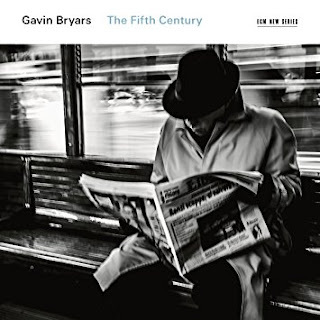 A new CD, The Fifth Century (ECM New Series 2495) brings us two choral works that are stunning in their sonic brilliance and reaffirm my appreciation of Bryars as an important voice of today. The album features the extraordinary vibrato-less purity of the choral ensemble The Crossing, conducted by David Nally. It is hard to imagine a better performance of these works and the ECM sound brings out the music with a heightened brightness. The opening title work combines the Crossing with the equally appropriate sounds of the saxophone ensemble the PRISM Quartet. Bryars brings the two groups into close intersection in harmonically uncliched, always stimulating and ravishing ways. He has perfect control over the ambient and linear dimensions as he hears them. Indeed no matter how many times I listen to this work it sounds ever fresh. The same is true but in a somewhat more intimate way on "Two Love Songs" for female choir a capella. I come away from this music reluctantly. I want to come back to it as soon as possible. Does the awakening of nature on these fine days have something to do with it? It seems like the open hopeful choral sounds here help "improve" nature or provide it a most evocative soundtrack. I am sure whatever the season this music will give us pause, help us revel in the sensuous mysteries of existence. Does this sound like a strong recommendation? I hope so. Because it is. Wonderful. I was awakened yesterday from my private world of dreams and expectations when I helped my nephew negotiate the ins and outs of a used car purchase from a dealer. As I was waiting for his credit to go through, I struck up a conversation with young ladies in the office. The talk chanced on music. "He makes CDs! Yes, he gave us one of them!" my nephew chimed in. Well just the format elicited reactions of astonishment and disbelief. I was an impossible anachronism. When one of them asked me if my music sounded like [name I didn't recognize], I tried in desperation to backtrack to common ground. I mentioned George Harrison. No. "Who is that?" I gave up. There is a specific audience for the music I cover on these pages, and the music I myself make, and they were not it. Or so it seemed. If it weren't for yesterday I would say that today's CD might appeal to a general audience as well as the classically oriented. Now I am more inclined to say "A specific wider audience," but perhaps not those who have grown up on the pop music that fills their earbuds. Nonetheless Oracle Hysterical, New Vintage Baroque and their joint collaborative album Passionate Pilgrim (VISIONINTO ART VIA -12) gives us a very appealing program of contemporary songs that one can profitably think of in terms of the principal ensemble's name New Vintage Baroque. As the liner notes assert, this is a music "dedicated to the creation of a 21st century repertoire for early instruments." Absolutely, that is what we have. What does that mean? This is an adventure in song form, of the modern day yet bardically story-telling. It is a contemporary tonal music that gives us some striking songs that have both a currency and a rustic feel. It does not have much in the way of Baroque counterpoint or that period's pronounced periodicity. But then it is readily distinguishable from the ordinarily modern nonetheless. The New Vintage ensemble was formed in 2011 by Baroque oboist Lindsay McIntosh. This latest set is comprised of contemporary songs composed by members of Oracle Hysterical. 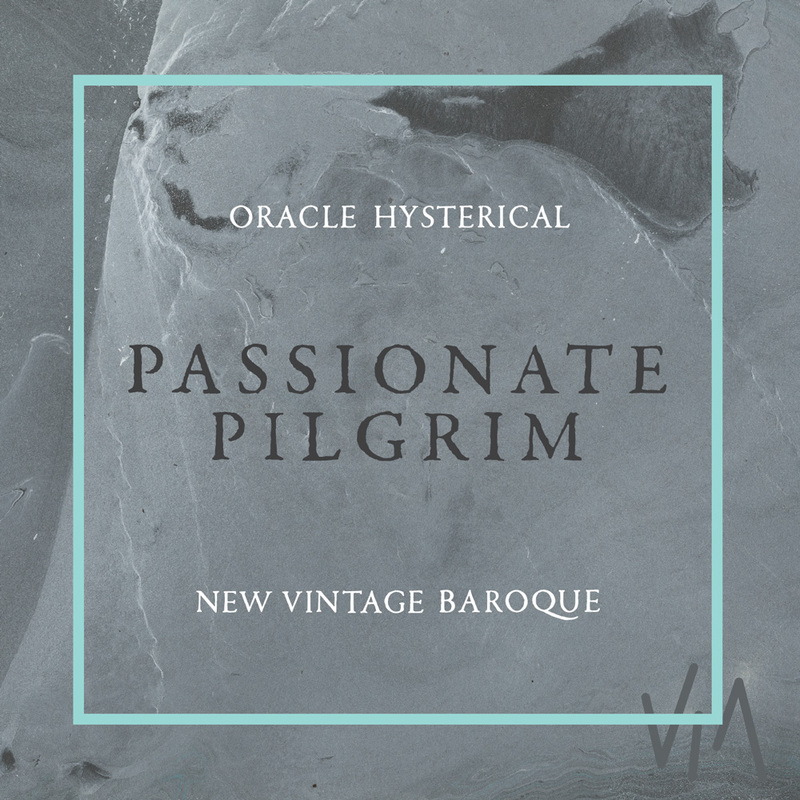 To clarify the album is very much a joint effort by New Vintage Baroque and Oracle Hysterical (the latter a quartet of bassoon, double bass-viola da gamba, and the voices of Elliot Cole and Majel Connery; the former an eight-person chamber ensemble of baroque instruments). The four members of Oracle Hysterical give us a set of songs that bear close listening. One revels in the lyric sensibilities and pronounced baroque sonics of the music. It sounds spring-like, the sound of poetic springs celebrated by the bards of an age long gone. It is not so much a nostalgia for an age we never knew, though that is part of the charm. It is mostly perhaps born of an urgently aesthetic need to reach back to earlier music to craft a music anew. You don't have to hear this in the spring, but it has the sound of a renewal we might feel the need of as I write this. It is music that will come alive with repeated hearings. The songs and arrangements are distinctly unique. I am glad to have this album and I recommend it warmly to anyone seeking something new that is born like Phoenix from the ashes of its past! Throughout composer Heitor Villa-Lobos' career (1887-1959), the guitar was a central voice in his music, and he among many other things is considered a father figure in the development of modern, folk-laced music for the instrument. Guitarist Andrea Bissoli is the central component in a three-volume set now available as an integral boxed edition. The Guitar Manuscripts: Masterpieces and Lost Works (Naxos 8.573117) is as the title suggests, a collection of his most illustrious works involving the guitar and also a worthwhile collection of works until recently lost to us or unheard, plus transcriptions of music not originally published in guitar versions, or guitar works transcribed for ensemble. I have previously reviewed all three volumes separately on these pages. 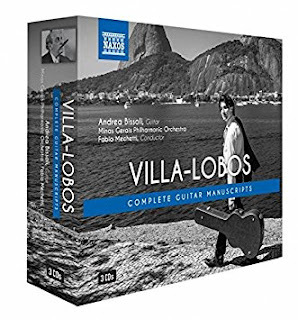 Type "Villa-Lobos" in the search box above to access those three volumes. Suffice to say that this is a very rewarding anthology of works for those new to Villa-Lobos as well as the seasoned listener. Andrea Bissoli and his collaborators give us a stirring view of the considered yet spirited music of the master. These is enough here that is new or re-arranged to supply anyone interested and following the composer's output with a fresh take. Olivier Messiaen (1908-1992), without question, was the most important and innovative composer for the organ in our times. He left us a body of work of incomparable modern power, mystery and depth. 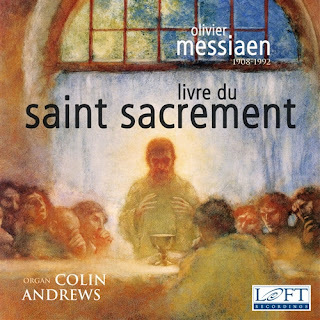 The gargantuan 1984 work Livre du Saint Sacrement (Loft Recordings LRCD-1152-53 2-CDs) is doubtless one of his most advanced, complex and spiritually probing works--and as I understand it, his last for the instrument. Colin Andrews plummets its depth and carefully renders its many moods and interworkings. The full score is divided into 28 movements, carefully sequenced to give us the musical equivalents of the Catholic ritual of communion and theological-mystical-devotional-biblical dimensions of the experience. 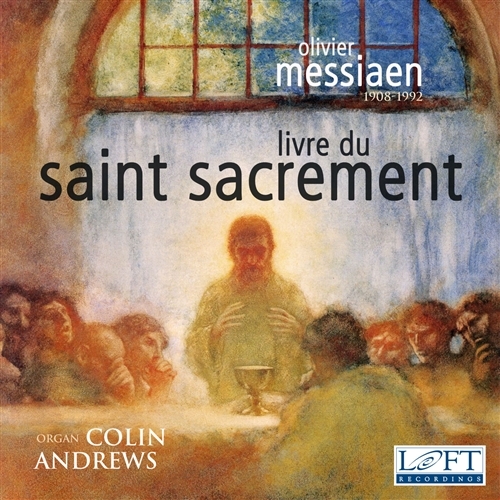 The compositional elements, as the liners aptly inform us, were a synthesis of Messiaen's mature techniques and procedures: Greek and Hindu rhythmic forms, Messiaen's transliteration of sacred words into musical utterances, a very personal serialism, limited transposition as defining the harmonies, plainsong and birdsong (the latter of birds Jesus might have heard locally during his lifetime). This is a huge undertaking that gives us a largely abstract, ultra-modern and extraordinarily meditative sequence that requires concentrated focus in the listening process. Here is a man whose religious convictions led to an extraordinarily singular universe of sounds, a musical language like no other, a lifetime's understanding of the full spectrum of the cathedral organ and its capabilities. In the hands of Colin Andrews the work speaks with a cosmic flourish and deeply interior dialog that is movingly spectacular, experientially radical yet tied to a deep spiritual understanding. It is literally words or feelings put into music but not easily converted back into words. By 1984 Messiaen had become a transcendent being of musical sound. This is Messiaen's message to us all, and some of the most difficult and involved, ecstatically rewarding organ works I have ever heard. Give this music your absorption and it will return the effort with a glimpse of the composer's intimations of eternity. Highly recommended, but not to be taken lightly! I have a bit of a soft spot for Granados (1867-1916)--and the recent Naxos series recording many of his orchestral works (that I covered here a while ago) has given me much to appreciate. 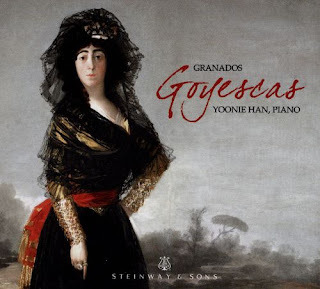 But whether or not one is a Granados convert one will likely take readily to his most famous work, the Goyescas for solo piano, a six-part suite that has been recently newly recorded by pianist Yoonie Han (Steinway & Sons 30067). The music is all about Francisco Goya, the famous Spanish painter, and his work. Each movement depicts a scene from an imagined love story of a Spanish Majo (bohemian, mostly lower-class Spaniards of Goyas' time) and his would-be Maja. The piano version of the work has enjoyed the love of music listeners since its premiere. It is an extremely lyrical and magnetic work that shows Granados' folk-Spanish, quasi-impressionist, melodic-harmonic gift as well or better than anything else he wrote. The South Korean native Yoonie Han gives us a glowing reading of the music on the recording at hand. She embodies the flowing melodic presence, the grace and stunning phrasings of each movement with all the poetic nuance the work demands. I've heard some ravishing versions of the Goyescas, but I must say that Ms. Han rivals the very best. The recording quality is superb. The music sings on. Yoonie Han triumphs. This version makes me very happy. Need I say more? There is no better introduction to Granados than this. It means virtually nothing that I do not believe I have heard the music of Amante Franzoni (flourished 1605-1630). The Renaissance (but also the Baroque) period produced many scores of composers who are not regularly performed these days, though many are extraordinarily capable. Judging by the recent release of Franzoni's Vespro per la Festa di Santa Barbara (Brilliant 95344), he was one of those we should hear more often, certainly. The blend of chants, sacred choral and instrumental parts to the Vespro is very appealing, especially in this performance by Francesco Moi conducting the amassed forces of Accademia Degli Invaghiti (a nine member choral group with accompanying theorbo and two organs), the Concerto Palatino with their two cornettos and six trombones, and the Cappella Santa Barbara handling the Gregorian Chant passages. It is beautifully a part of the period, inspired, resounding gloriously in the Mantua Cathedral setting. The chant interludes refresh and set off the moving choral-instrumental movements. As you first listen you hear a brief Resposorium that many will recognize as I did. It is borrowed from Monteverdi's "Vespers for the Virgin Mary." The music that follows is in keeping with the period and place. Franzoni flourished in the Italian city of Mantua, working for the Gonzaga duchy as early as 1607 and serving as maestro di cappella for the Basilica of Santa Barbara from 1612 through 1630. The Feast of Santa Barbara was the most important religious celebration in Mantua during Franzoni's tenure. She was the city's patron saint and so the vespers in her name allowed Manzoni to create an elaborate musical commemoration in her honor. The CD captures the music in considerably spirited and in haunting ways. Any early music appreciator will no doubt welcome this music into their world, a fabulous recording at a good price, too! The complex of components that channel into a contemporary new music composer can be enormous, and ultimately the outcome can be original but on the other hand is all-the-more frequently not. So in the end we listen and open ourselves up to whatever we encounter. In the case of Thierry Pecou, and the album of orchestral works Orquoy, Chango, Marcha de la Humanidad (Wergo 7318-2) I immediately was intrigued by what I heard. But what was it? As I listened for the first time, I turned to the CD booklet for guidance. Like anybody who listens seriously to previously unknown composers-music, I find that the liner notes often can situate the music so you can go on with some understanding. Wergo has long been a label crucial in the new music scene, so I tend to trust what they might say. The notes told me, hey, Latin America is a key. Think of Villa-Lobos, Revueltas, Chavez, how they synthesized European modernism with local folk traditions and influences. Then think of a new generation of composers and how they extended modernity into further abstract territory. That in part explains Pecou. My initial recognition of color and strong rhythmical elements might have reminded me indirectly of Varese, Messiaen, Boulez, yes, but there was the (OK I'll use the word though it ain't gonna sound down-to-earth) autochthonous (indigenous) aspect to consider in Pecou's music. And ultimately what he does with all of this is very original. The liner notes helped point me in the right direction. My ears did the rest. The opening "Orquoy" for large orchestra is very much a good place to start. The music jumps forward with an almost whimsical but unerringly new kind of sonance and presentation. Each of the three works has something very rewarding going on--at a height of high modernism but still anchored to the earth like a folk rooted tree whose height into the sky is equalled by the long and mostly unseen labyrinthian root appendages. Jonathan Stockhammer conducts the Orchestra National de France on this program and to my ears he devotes all the care and insight that one might hope for in such unusually original fare. The album gives me an excellent view onto Thierry Pecou's musical universe. Anyone who appreciates the high modernist paths and/or South American modernism-nationalism will I hope find this music very much to his or her liking. I did. When it comes to Johann Sebastian Bach's works for solo violin and solo cello, it seems to me that their popularity and influence are at a peak. Or is it just that my appetite for hearing them has become more insatiable as I seem to continually hear them anew? But it is not just me. I have come across and mentioned on these pages a number of interesting compositions in the contemporary new music scene that make use of solo Bach in creating new confluences. And the number of new releases of recorded performances of the solo works seems higher than ever before...and more diverse in terms of the baroque to modern spectrum of possibilities. I won't try to explain why this may be so. I cannot easily say, except to note the possibility that we are in a new baroque era ourselves, aesthetically speaking. A discussion on that would tip the balance of this review away from the music itself, so I must cut it short. Regardless, the solo works speak to us today as some of the most direct expressions of Bach's genius, surely. And string players have for a long time had the tackling of these works as a key part of their training, no? What counts in the end is their beauty, their facing of the musical cosmos with just four strings and a wealth of inventive brilliance. 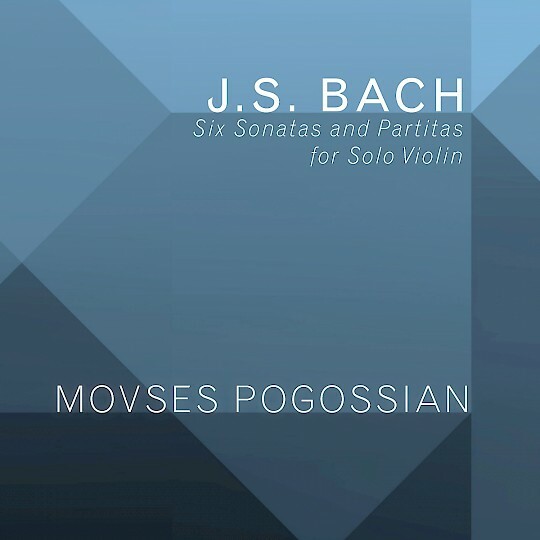 Armenian violinist Movses Pogossian brings us a new version of Bach's Six Sonatas and Partitas for Solo Violin on 3-CDs (New Focus Recordings FCR 178) and I for one am glad he did. I've been immersed in the recording for a couple of weeks, sounding a constant as the parade of life passes by, anchoring me in the unassuming but vastly rich music that counters all that life might hold in store, or amplifies it, depending on how life is at the time. For me it is more a countering these days. At any rate Pogossian does not bring us an ultra-baroque reading, with catgut strings, baroque bows and a litany of ornamentational end points. He choses the conventional modern violin and a straightforward but feelingful production of the six works. Nonetheless it sounds very true to Bach, so I guess one could say it is a middle-of-the-road version. Pogossian gets inside the music and gives us strong performances of the very sturdy sections, then slows down to savor the movingly preludian portions. In the end Pogossian sings from his depths and thereby channels Bach in ways that bring us joy. I most certainly recommend this version if you don't have one yet. It is a benchmark for how we hear the music today. It also extends and compliments other versions, you who like me cannot seem to get enough. Pogossian is a true artist. His Bach rings with its own creative truth. That is a great thing. The classical period of opera, partially because of the expense of a production, partially because of conservative, certain masterworks-only repertoire tendencies, has not been given as extensive a coverage of what was produced as one might wish. There are multiple versions of, say, Mozart's The Magic Flute or Rossini's The Barber of Seville available, but if you wanted to find a full opera by Johann Simon Mayr (1763-1845), you would probably be out of luck. Until now. It is true that we do not miss what we do not know--but with Mayr we are missing something good, someone we should know. Naxos with their most welcome, adventurist releases of neglected composers and/or works, has been coming out with some Mayr overtures and operas (I've covered a few here recently), and so we now have a 2-CD set of Amore non soffre opposizioni (Naxos 8.660361-62), conducted by Franz Hauk, the man instrumental in the current Mayr revival. The reasons this opera and Mayr himself enjoyed popularity in the Italy of the classic age are the same reasons this opera appeals to us today if we give it a chance. There are no recitatives, there is a vibrant tunefulness, a sprightly demeanor, and sophisticated harmonies and instrumentation. We are treated to a very good performance--here by engaging, idiomatic soloists and the East-West European Festival Orchestra. As you listen for a while, you notice a kind of synthesis between the Italian influence of Rossini and the German one of Mozart, which in Mayr's hands seems unforced and natural. That this is in every way a carefully conceived and enthusiastic performance goes a long way towards bringing Mayr alive for us. Anyone who loves classical-era opera will find this release delightful.